Paper Size: 25.75" x 22"
Cruising high above the city and harbor Navy fighters signal the arrival of one of the most important ships of the day, an aircraft carrier. In the late 1920s aviation began to bloom within the U.S. Navy and the aircraft carrier gained recognition as the warship of the future. The diminutive Boeing fighter, the F4B-2, was one of the most successful designs of the period. With an operational appeal to the Army as well, the Boeing design evolved into the well known P-12 series. 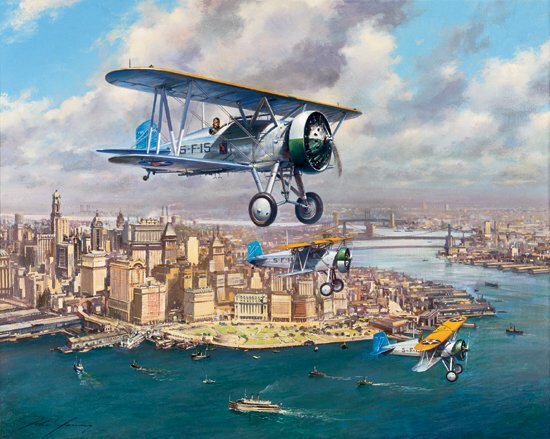 Carrier aviation has changed as dramatically as the Manhattan skyline but Naval Aviation has a foundation as solid as the city below.